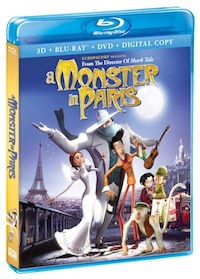 A Monster in Paris on BluRay & DVD April 16! Venture into the delightful Parisian cityscapes 1910s and spellbound by the visually opulent family adventure of A MONSTER IN PARIS, directed and written by Bibo Bergeron (Shark Tale) and produced by world renowned filmmaker Luc Besson’s EuropaCorp and Bergeron’s Bibo Films. With an exceptional English-language voice cast of French singing sensation Vanessa Paradis, singer/song writer Sean Lennon, Catherine O’Hara (Penelope), Adam Goldberg (A Beautiful Mind), Bob Balaban(For Your Consideration), Danny Huston (Hitchcock) and Jay Harrington (Private Practice), A MONSTER IN PARIS harkens back to the classic tale of beauty and the beast, and delivers vibrant storyline packed with elegant characters, unforgettable song-and-dance musical numbers and beautiful CG animation that the whole family will enjoy! This critically acclaimed international major motion picture also features enchanting, honey-toned vocals by Vanessa Paradis and Sean Lennon, with music score by popular French singer/songwriter Matthieu Chedid (aka M) and Patrice Renson. On April 16, 2013, Shout! Factory, in collaboration with EuropaCorp, invites kids and families across America to a whimsical world of Parisian adventure and fantasy when Shout! Factory, in collaboration with EuropaCorp, unleash A MONSTER IN PARIS on DVD and on two-disc Blu-ray™ 3D Combo Pack. The Blu-ray™ 3D Combo Pack allows viewers to enjoy A MONSTER IN PARIS on the platform of their choice and includes spectacular movie presentation on Blu-ray 3D and 2D, DVD and a digital copy of the movie compatible with PC, MAC, iTunes, iPhone and AppleTV. I will have to keep a look-out for this one. 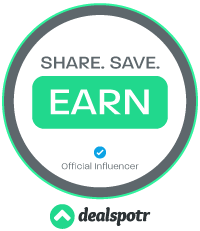 Thank you for the review and have a great weekend. My family would enjoy watching this movie. Thanks for the heads up!